Snow Much Fun! Such Bright Colors!! This snowman couple is as bright as they come! 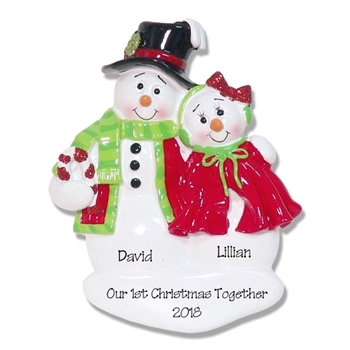 It is a great personalized gift for a couple, a first Christmas or even friends or siblings. As is the case with all of our ornaments, it is very detailed. Sprinkled with just enough glitter to give it some sparkle. This ornament is easily personalized but looks great without. Designed by Debi Allison, it is made from RESIN and hand painted. It comes complete with a hook and satin ribbon for hanging. .
ALL ORNAMENTS IN MY STORE ARE DESIGNED AND COPYRIGHTED BY ME AS WELL AS THE PHOTOGRAPHY.